If you’re looking for information about the difference between investing and gambling, then you can relax because this is the article that you’ve been searching for. After all, they are both risky, and they are both capable of changing your bank account. In this article, we’re going to discuss a couple of ideas that will help you understand them. First, we’re going to define them in a strict sense. Next, we’re going to discuss the similarities between the two. Finally, we’re going to wrap up with how both can provide financial gains as well as entertainment value. Keep in mind this relates to all form of betting, even trading stocks and gambling online remain 100% relevant here. There has been any long standing feud between Wall Street and Las Vegas Boulevard over the similarities between investing and gambling. Understandably, Wall Street wants to distance itself as much as possible from being perceived as gambling. Conversely, Las Vegas casino owners get a real thrill out of tweaking Wall Street types by asserting that gambling is no riskier than investing in the stock market. Invest — to commit (money) in order to earn a financial return. Gamble — to play a game in which you can win or lose money or possessions: to bet money or other valuable things. It’s no wonder that there’s so much unnecessary confusion about investing vs. gambling when the very definition of the terms suggest that there are more similarities than differences. Let’s be clear about one thing, there’s no ambiguity of terms on the part of professional gamblers or professional investors. They know exactly what they’re doing, how to do it, and why. It’s the average person that needs to clarify their thinking when walking into a casino or taking a stroll down Wall Street where their wallets are at risk. For one thing, both endeavors enjoy a profit motive. People don’t play roulette simply for the thrill of watching a little white ball spin around a disk. They want to experience the exhilaration of winning a big jackpot at a real money casino. Similarly, people don’t invest in stocks simply for bragging rights. “Hey! Look at me, I own 100 shares of IBM and Google stock.” Both groups of people want the same thing, they want to make cash. 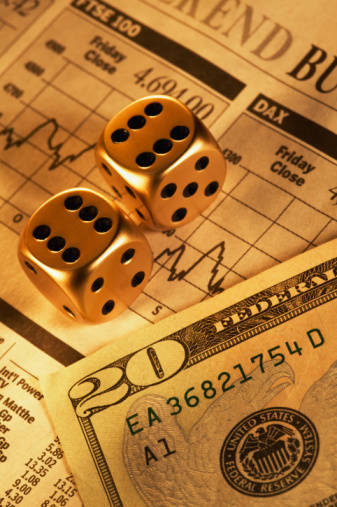 In addition, gambling like investing, involves certain risks. Participants in each activity speculate on the probable outcome of that risk and attempt to tip the odds in their favor in order to win. That’s why professional gamblers spend most of their time playing blackjack instead of slot machines. When playing blackjack a skillful gambler can to be odds in his or her favor and when more often than lose. The big kahuna of both investing and gambling is the payoff — that is, the financial gain. If there’s no payday at the end of the week, what’s the point in playing? Certainly, it’s not the thrill of risking the loss of one’s capital. One fact is for certain, successful gamblers and investors alike agree that the key to winning is discipline. They have the discipline to never bet or invest more than they can afford to lose. They possess the discipline to never bet or invest without amassing the knowledge necessary to tip the odds of winning in their favor. Finally, both endeavors involve a certain amount of adrenaline rush. Waiting for the outcome of one’s bet, whether it’s on a blackjack table or on the fundamentals of a corporation, invokes the proverbial feelings of the thrill of victory or the agony of defeat. So pick your poison, go to Wall Street, Mobilecasinoparty.com, or Vegas, is there really that much difference to make it worth even thinking about? You decide and enjoy it, but be careful, or you may lose your money while trying to make… money.